Leaving the care of your elderly loved ones in another person’s hands is not an easy choice. However at OptimumCare Home Care Services, we just want to help improve people’s well-being and lives. If you are still hesitant abouthome care services, here are some reasons why it is definitely the right choice for you. 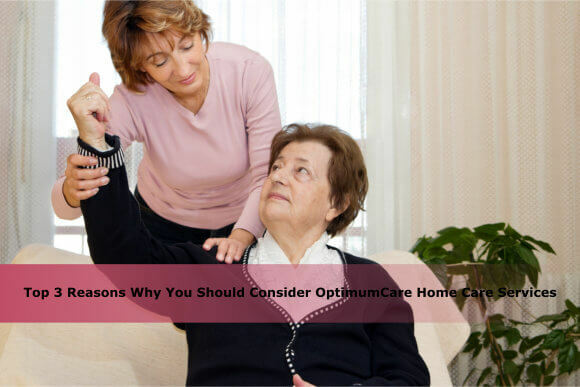 Reasons Why You Should Consider OptimumCare Home Care Services. We are reliable.We are recognized as one of the best providers ofnon-medical home care in Opitz Boulevard Woodbridge VA. With us, you can rest assured that our staff and caregivers are licensed, trained, and certified.We understand your needs and our top priority is to help you or a loved one achieve greater security, mobility, and independence within the comforts of your own home. We promote independence. At OptimumCare Home Care Services, we encourage our patients to remain as independent as possible. We don’t want them to feel isolated and helpless – we are only here to assist and guide them as much as they would allow us. With a few modifications for safety like anti-slip rugs, grab bars and the like, we want to give our patients the freedom to move around on their own. Family Involvement. With home care, your loved ones will have the advantage of open visiting hours. Your family members can drop by anytime they want to help out. At OptimumCare Home Care Services, we firmly believe that the presence of family members can help boost a patient’s well-being. These are just the top three reasons why you should definitely choose us as your home care provider. We are the best non-medical home care in Opitz Boulevard Woodbridge VA that you can find. With us, you can rest assured that we will always put you and your loved ones first. Call us today at 703-490-8003 for more information about our services.